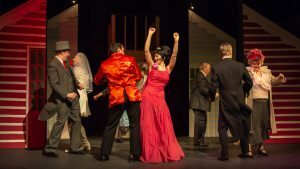 Norwich Players gave the audience a lot of laughs as they performed Alan Bennett’s Habeas Corpus at The Maddermarket Theatre. 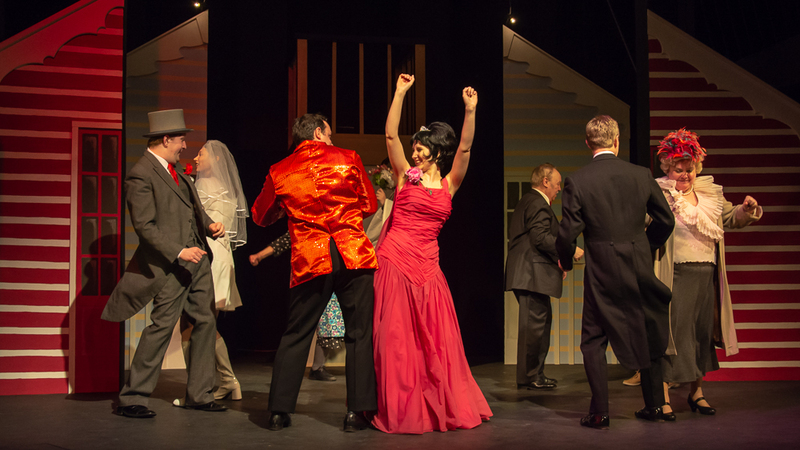 The play is set in the middle-class, respectable seaside town of Hove in the late 1960s. The action takes place in and around the home of Arthur Wicksteed, a general practitioner played by Trevor Burton, and his wife Murie,l played by Gill Tichborne. The couple have a son Dennis, a sexually repressed hypochondriac, played by Laurence Grunbaum. The sexual revolution of the 1960s has passed the Wicksteeds by, but a hint of what they perceive as the permissive society is drifting in to the folk in and around the family. The doctor has a mental battle with what he sees as his professional life and his natural randy instincts. The result is a romp through the hang-ups of respectable people losing their dignity and also their trousers in the style of a good farce. The audience enjoyed and applauded the bumbling celibate cleric, the flat-chested spinster, the pompous Sir Percy, the sales representative of false breast enlargements and the old colonial lady and her attractive young daughter. Linking all the characters together is Mrs Swabb, played by Jude Wyatt, who knows all their secrets and weaknesses. This entry was posted in Home Page, Uncategorized and tagged theatre on April 30, 2018 by Gay Webster.